[By Nick, New for 2014] ‎After half a year of waiting for it to be produced, a searched that spanned several months, a couple of area code and numerous counties, I have finally got my hands on the collaboration between two of my favorite companies: Turkey Hill and Peanut Butter & Co. Oh how I have dreamed of this day. I mean the internet has been a buzz with this flavor and I've been going into grocery store after grocery store only to find Mango occupying the limited edition all-natural flavor spot. I was seriously have Ben & Jerry's Pina Colada flashback (which I still see on occasion) At long last though, the glorious combination of bananas and peanut butter is mine! I can't wait anymore, let's get into this! MOTHER OF ALL THINGS GOOEY AND DELICIOUS, JUST LOOK AT ALL THAT PEANUT BUTTER. This is easily the greatest amount of peanut butter I have ever encountered in an ice cream and it continues all the way through the container. There's like a 60/40 split of ice cream to peanut butter going on here and it's beyond awesome. Oh yeah, you guys want to know about the taste, don't you? Well I can honestly say that it has lived up to all the hype I have built up in my head. Heck, it even exceeds my expectations. I was worried about the banana base as I do with anything with a banana flavor but that was not necessary. Turkey Hill has managed to get the right amount of ripeness from their bananas making this one of the best banana bases I've had. Since this is all-natural, I didn't have to worry about any of the off-putting artficialness that plagues other banana flavored things but I was worried it would be too ripe like Haagen-Daz or Talenti's. That's far from the case and I'd say this base is on par with Stewart's Monkey Business (that I review over here for our friend Junk Food Guy) which is my favorite banana ice cream to date. The peanut butter is just how you'd expect it to be. Beyond amazing! I have praised Peanut Butter & Co. over and over again for their peanut butter normally and use it exclusively for all my sundaes. That all-natural peanut butter mixed with the banana base makes for a combination that Elvis would be proud of. 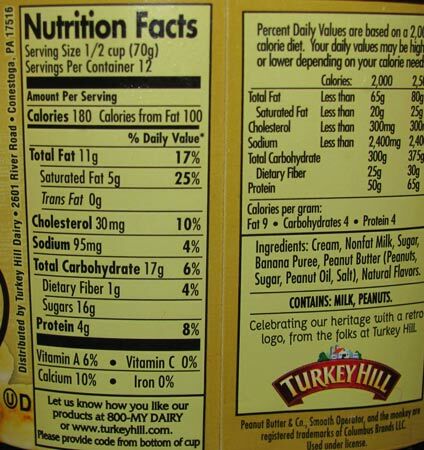 Turkey Hill should really just ditch the peanut butter they use in their other flavors in favor of PB&Co. 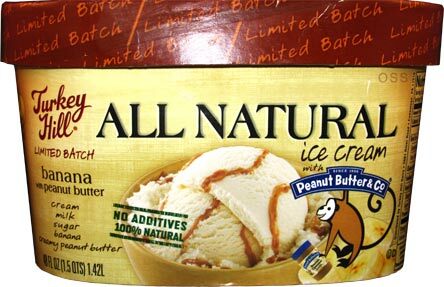 Now you're wondering if this surpasses Monkey Business as my favorite banana ice cream and the answer is simply, no. The fudge swirl and fudge chunks make that flavor for me. However, this is easily my second favorite and the best limited edition flavor I've tried from Turkey Hill this year! I want, no, scratch that, I NEED for there to be more collaborations between these two companies in the future. There's so many flavors of peanut butter that PB&Co. has in their arsenal that it would be a no-brainer to continue this partnership for years to come. From White Chocolate Wonderful mixed with strawberry jelly, pound cake and a vanilla bean base to Mighty Maple mixed with waffles in a buttery base, the combinations are endless! If you guys need help coming up with flavors, you've got my contact information! Verdict? Buy this and stock up while you can! 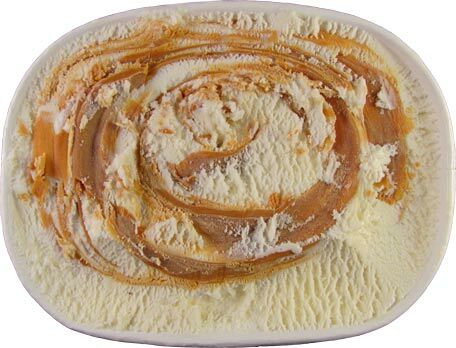 Now that's my kind of peanut butter swirl! If only the base was not banana flavor, then I would definitely try this. Turkey Hill needs to do this again with a different base and the same quantity of swirl, even if it is with just a plain vanilla base. I'm so glad you found this one Nick, as it's defiantly epic on all fronts! I too hope PB & Co continue their partnership because they could really elevate Turkey Hill, a brand that's already my personal fav. 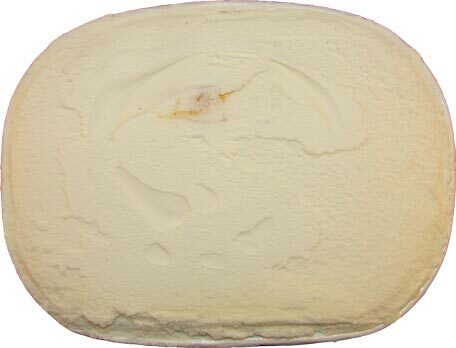 Stride, they do make a peanut butter ripple ice cream in their normal line as well as a chocolate peanut butter cup flavor which is just chocolate ice cream and a peanut butter swirl. I've had the latter and there was a lot of peanut butter in it, just not up to the quality of peanut butter & co. offers. I know they have a peanut butter ripple flavor but I didn't think it would be nearly as abundant as the peanut butter swirl in the Banana with Peanut Butter ice cream. Stride, if there's one think Turkey Hill always succeeds at, it's an ample amount of swirl!